For the most part, when it comes to knitting, I’m a bit of a cheapskate. Sure, I shell out for luxurious yarns, but I really am a “one skein wonder” kind of gal. Sock yarns make a pair of socks per skein, lace-weight goes a long way; I seldom get enough of anything to make a ‘big’ project (sweater, scarf, etc). Likewise with patterns. Rare enough do I buy magazines or books, let alone shell out for single patterns (in store or online). Especially with more free patterns available online than I could ever knit in my lifetime, it takes a lot to impress me enough to part with my cash. Keeping baby warm in wool. The Baby Surprise Jacket that no-longer-secret pal Tanya knit for my baby-to-be has been keeping Morgana nice and toasty as the weather turns from fall to early winter. (We’ve had real snow here a few days! Just nothing that sticks.) I’ve also been knitting her a few little hats (you can see one in-progress beside me on the couch! ), since baby hats never seem to be made to baby-head size, but I also seem to have a great knack for losing them in the house, so there are no photos! Thank goodness baby things are so small and quick to knit — I think we’ve got a chilly winter ahead, and many things to make up! 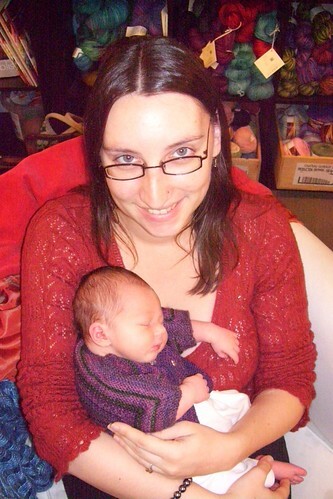 She also sported the purple BSJ on her first-ever outing — to the Purple Purl, of course! (Let’s get this one addicted to yarn good and early, shall we?) 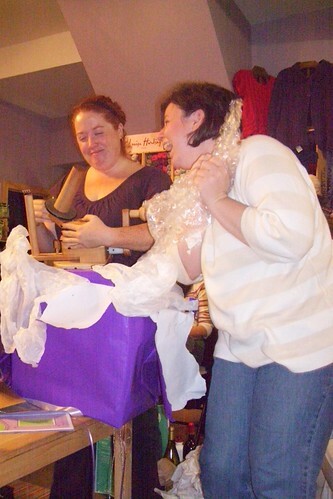 The Purl celebrated it’s one-year anniversary of opening this past Saturday, and some of us gathered Friday night to wish them a happy birthday, complete with surprise presents! Mom & Baby leave the house for the first time, to sit comfortably amid good friends and colourful yarns! More photos of the baby and the shop’s celebration can be found on my Flickr. On the whole, we’re all doing really well: settling into new routines and roles, gaining confidence as parents, loving the baby-time, starting to leave the house for errands and fun, and even finding a bit of time to knit! – Baby M. is awesome. I cannot believe how much love can be felt for such a tiny creature, that the heart can swell to encompass this love without displacing all others — I think I am loving Dru, my friends, and our families more than ever, too! – There is a time-blurr effect happening here (can it really be her 1-week birthday tomorrow? ), and I think I’m starting to enjoy this haze. I haven’t left the house since I was in labour, but I love being in our warm little nest. – I have actually knit something — a baby hat! No photos, though, because I’ve lost it somewhere. It was a bit big anyway, so maybe I’ll try another… There is also an FO (a BSJ) that needs to be photographed, which was finished while I was in prelabour, but it’s way to big to be modeled by M. currently. Love natural animal fibers (wool, silk, alpaca), haven’t had much ‘time’ with natural plant fibers (cotton, bamboo, linen, etc) but would like to try more out, and can’t stand man-made fibers (acry-icky!). A giant messy bin. Must fix this. About 6 years now — I consider myself an adventurous intermediate. E.g. : I’m not afraid of lace, but have never attempted intarsia. Right here! Note I have sub-divided lists for knitting books & spinning books separate from novels & stufff. HUGE sweet tooth! Love me some chocolate (dark & organic, even better!). No nut allergies, but not a huge peanut fan. I spin on bogh drop-spindles and wheels (have an Ashford Joy). I have the stuff for needle-felting but haven’t palyed with it much. I also sew, craft spindles, and dabble in various other crafts. I definitely have mp3 capabilities, and love Celtic and folk music, as well as “world fusion” (e.g. Indian-inspired) folk & electronica. I’ve been on a purple & lime kick of late, but also love burgundies and warm autumnal tones. Brand New Baby Girl!!! And 2 sweet cats. Smaller projects — socks, mitts, etc. — generally over large ones, but I’m having more success with sweaters these dasy, and usually have one long-term lace project on the needles somewhere. I’m exploring the new world of “baby knits”! On the needles currently for myself is a February Lady Sweater, though. Love it! I’m greatly appreciative of receiving someone else’s creativity & time. I prefer metal circulars (Addis are the best!) and wooden for straights. A couple of years. I’ve culled the worst offenders, I think. 18. What is your favorite holiday? What winter holiday do you observe? The winter holiday season is my absolute fave, always has been. I love the colours and lights and excuse to go baking-mad! My household celebrates Yule; it’s Christmas with the parents/in-laws. Books of faerie art, primarily coffee-table books of Brian Froud art. And yarn & spinning fliber, of course!! I’d love a set of Harmony circs., and there are many knitting books that look interesting but I don’t tend to buy them for myself (see amazon list). I don’t have any subscriptions, but routinely buy Interweave knits and Spin-Off, and usually get the holiday & F/W Vogue Knitting. I’d like to get better at colourwork. Sure am! Love to knit socks :) I wear a ladies US size 8-9. 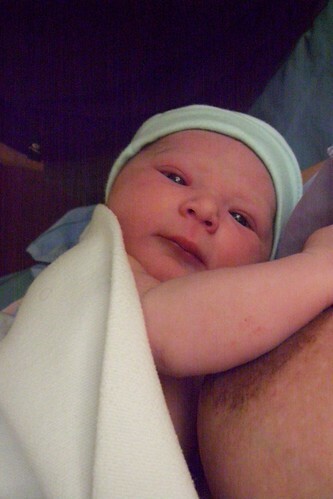 Our daughter Morgana Amelia was born on Thursday November 6th at 7:07pm, weighing 7lbs 3oz and measuring 52cm. 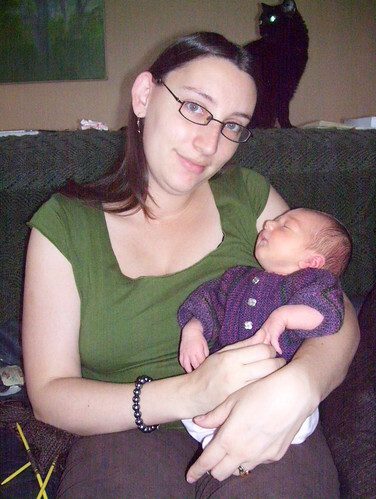 I had a *very* long home labour and eventually needed to transfer to the hospital for delivery, but came home just a few hours after and have been in a happy fog of new-parenthood ever since! I hope to write up a more complete birth story once I’ve recovered my braincells, but for now just know we are all happy, healthy, and utterly entranced with this beautiful new creature. About 1/2 hour after birth. Formerly "Not Another Knitblog!" Now, a collection of assorted thoughts, photos, feelings... Ephemera. Aemmeleia's Ephemera · Knitting. Spinning. Parenting. Yoga. Life!